GM012: Sn3 Handlaid -- 6 foot 6 inch ties -- matches Mt Albert MA-277 or Kappler ties exactly (5" x 7" x 78"). 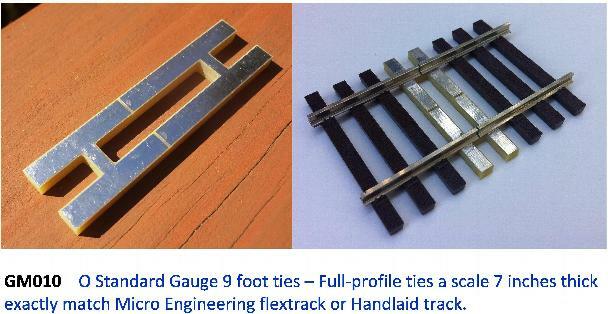 Also matches P-B-L flextrack ties in all dimensions. GM013: HOn30 -- 7 foot ties -- matches MicroEngineering (custom run, shown above) flextrack, Railcraft flextrack (ties need to be cut or sanded slightly), or Handlaid. GM014: On2 -- 5 inch x 5 inch x 5 foot ties on 2 foot centers. GM015: S Standard Gauge -- matches Tomalco flextrack exactly. Also suitable for Handlaid track. 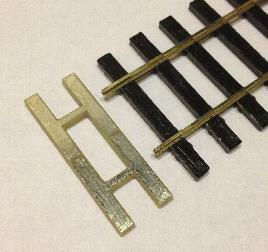 Note that gap is offset from center for ease of constructing dual-gauge trackwork (see GM007 example below). GM017: On3 Handlaid -- 6 foot 6 inch ties -- matches Mt Albert or Kappler ties exactly as well as PSC Top-Trak (Shown) and other On3 flextrack. 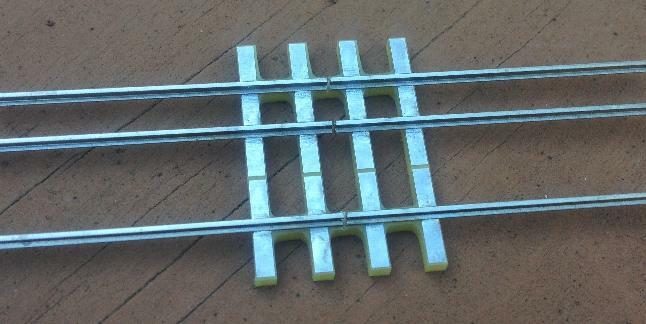 Note how the offset-center gap (standard in all standard-gauge Gapmasters) lines up perfectly in the middle of the 3 foot gauge rails for dual-gauge trackwork! Please email us at sales@americantieandtimber.com to provide suggestions on other scale/gauge combinations that you would like us to support. Thank You ! Shipping and Handling is a flat $5 fee in the 48 contiguous United States and $10 to anywhere in Canada, regardless of order size. Overseas shipping is available for a reasonable rate. We accept cheque, money order or PayPal. Free Samples are Available !